NOTE: This profile is a Work-in-Progress! Hello! 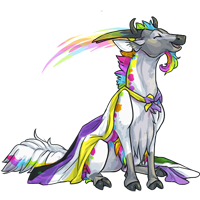 I'm NB, one of Bug's treasured subeta pets! If you are wondering about my name, it's actually short for nonbinary and it's pronounced like "enby". If you're new to the term, I've written a little FAQ below that might be able to help! Q: What does 'nonbinary' mean? A: "Nonbinary" is a general term for any gender that falls outside "male" and "female". You can think of it like this: Some people are boys, some people are girls, and some people don't really fit in the neat categories of "boy" or "girl". For example, some people might feel like their gender is a blend of boy and girl, and others might feel they are neither. The whole "boy or girl" idea of gender is called the gender binary - which is where the "binary" part of "nonbinary" comes from. There is nothing wrong if you are definitely a boy or girl! But there's also nothing wrong if you think you aren't exactly either. Q: What do 'cis', 'agender', 'genderqueer' and other terms like that mean? A: These are all terms to describe gender identities! The term "cis" (or "cisgender") means "identifies what you were assigned at birth". When you were born, the doctor probably looked at you and wrote "male" or "female" on your birth certificate. If you identify with that, then you're cis. This term is sort of meant as a mirror term to "trans" (or "transgender") which means you don't identify with the gender you were assigned at birth. Q: What does it mean if someone prefers they/them pronouns? How do I use those pronouns? A: Since "he" and "she" are gendered pronouns, frequently people who are nonbinary or otherwise exploring their gender will want "they/them" pronouns instead. Nonbinary people have different preferences though, and some might prefer a gendered pronoun or simply not care, so it's best to just ask politely if you aren't sure. The good news is that singular they/them pronouns have been in use for ages, so it shouldn't be too hard! Imagine you're sitting in a library and you notice a backpack on the seat; you might bring it to the front desk and say, "Someone left their bag here! I hope they come back for it!" It's just like that. Wherever you would say he, she, etc, just substitute with they instead. Q: How can I be supportive to my nonbinary friends? A: First off, remember they are people just like you, and don't begin treating them differently just because you've learned they are nonbinary. They are still a human being first and foremost! If they have expressed a preference for name and/or pronouns, make sure you use what they prefer. It's natural to slip up sometimes if you are getting used to a different name or pronoun for somebody, so if that happens, just quickly correct yourself and move on. For example: "The other day, he told me- sorry, they told me blah blah blah..."
You might have a lot of questions about being nonbinary (either in general, or what it means to them), but make sure they're comfortable answering your questions before you ask. If they decline, or seem uncomfortable with it, please don't push them to talk about it. Remember that they are not obliged to justify or explain their identity. Finally, don't be afraid to ask them if you are unsure of how to be considerate of their needs. Nonbinary people are still individual people, so no FAQ can tell you the best way to support your friends specifically. The best way to find out is through respectful communication. Q: How do I know if I'm nonbinary? A: If this label does resonate with you, then ultimately you are the only person who can decide if you are nonbinary or not! If it feels right to you, then it is. There is no way you need to dress or behave to count as nonbinary. Remember that labels are meant to serve you, and there is no obligation to adopt a label you don't feel ready or otherwise want to adopt. It's also fine to spend as long questioning and exploring your identity as you need.